So, does this tea live up to its rating designation? The little kitty creamer waits to add milk to that lovely tea! A couple of teaspoons of tea leaves (broken leaf pieces with a wonderful malty/jammy aroma) in the pot. A couple of cups (16 ounces) of boiled water. Five minutes ticking by on the clock. Ding! Time to see what we have here. The liquid streamed out a beautiful reddish brown. The aroma had that true Assam maltiness combined with a wonderful nuttiness. The first sip definitely did not disappoint. One thing to beware of with Assams is bitterness, especially when steeping longer than three minutes. Having steeped this one for five minutes and having it not be bitter was an indication to me of a higher quality tea. I’m the type who likes my black teas with a bit of milk and sweetener. This one was good enough to drink straight, but just for the heck of it I wanted to try it that way. Only a little milk was needed, so I used my small and decorative creamer in the shape of a cute kitty. 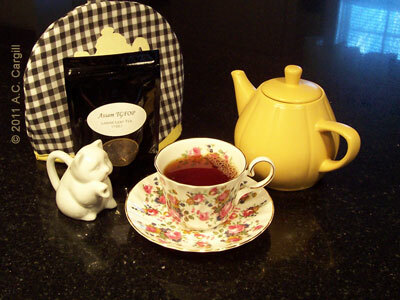 (Somehow, cute teawares make any tea taste better and great teas taste super!) The flavor was smooth, but the tea nuttiness still came through. Is Snobbery Ruining Assam Tea? Disclaimer: This tea was provided by the company named. 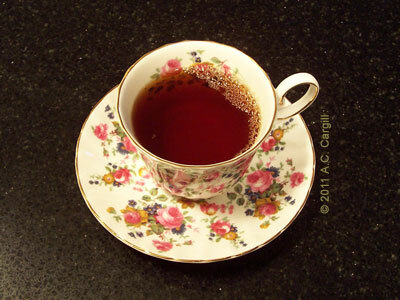 However, any opinions concerning this tea and the company are always strictly objective. I bought this Assam recently. Thanks so much for the explanation of the TGFOP. I was mystified by that. I like it very well.